While I’m in the mood to spill all the family recipe secrets…here’s a gooood one. Couldn’t you just reach through the monitor screen and pinch some of that cheese? 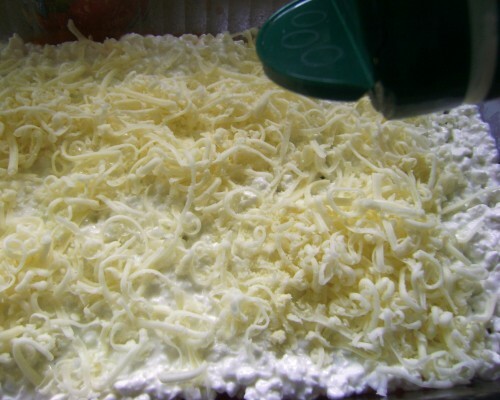 Shred the Mozzarella cheese first thing. You’ll want all your ingredients sitting there ready to go. Seriously, shredding the cheese is the only thing that takes any time here. Pour a small amount–maybe 1/2 cup–of sauce in a 9×13 Pyrex dish. 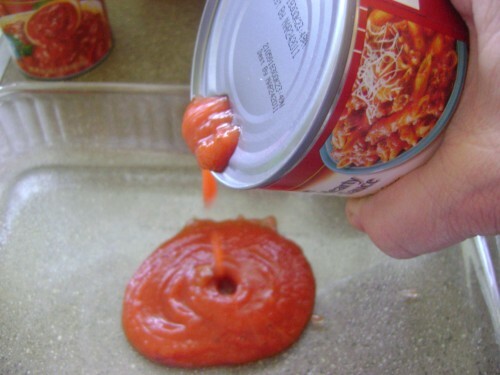 Tilt the pan around to spread it over the bottom of the dish. I’m going to use the word “some” quite a bit, because there is no exact recipe with this. Place the uncooked noodles on top of the sauce. Don’t you just hate mushy noodles? That won’t be happening this time. 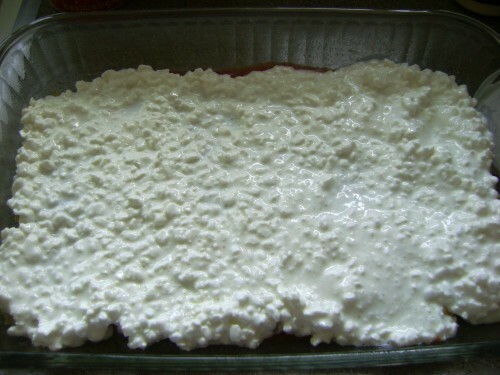 Top the noodles with the cottage cheese and spread it completely over the noodles. 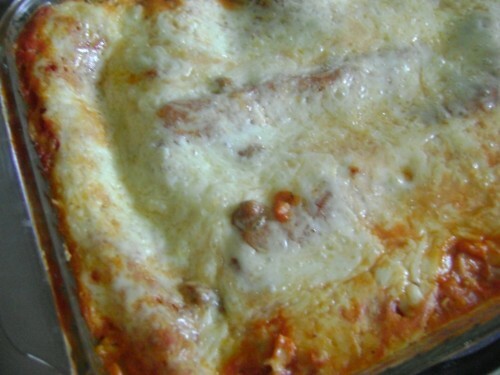 Top with a layer of Mozzarella. Sprinkle liberally with Parmesan cheese. Top with noodles, then sauce, then Mozzarella, then Parmesan–in that order until you reach the top of the pan or you run out of something. 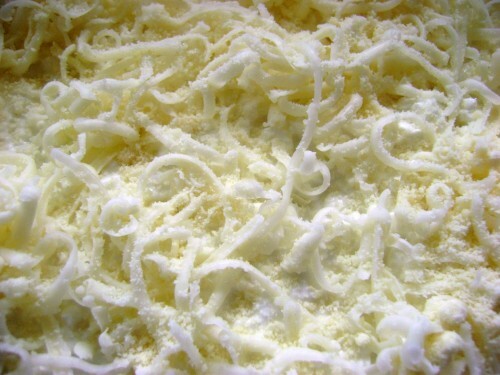 Make sure you save plenty of shredded cheese for the top–you won’t be sorry. like this. Let this beautiful thing rest for about 10 minutes. You can toast some garlic bread and toss a salad while you wait. You are about to experience perfection. 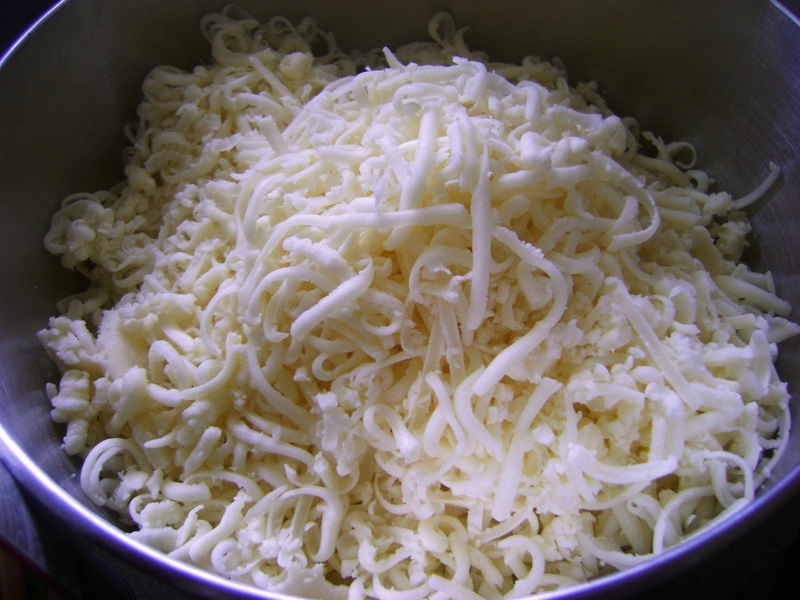 Shred the Mozzarella cheese first thing. Pour a small amount--maybe ½ cup--of sauce in a 9x13 Pyrex dish. Tilt the pan around to spread it over the bottom of the dish. 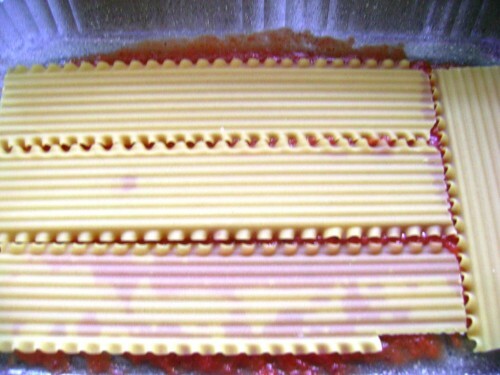 Place the uncooked noodles on top of the sauce. 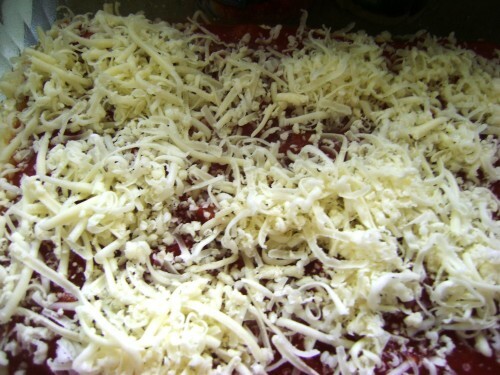 Top with a layer of Mozzarella. 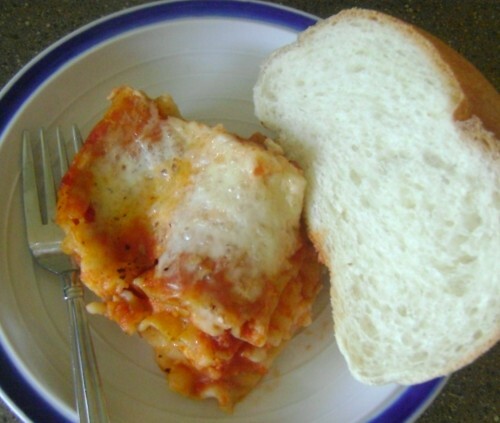 Top with noodles, then sauce, then Mozzarella, then Parmesan--in that order until you reach the top of the pan. Make sure you save plenty of shredded cheese for the top. Seal the pan with a layer of foil--shiny side down. Cook at 325 degrees for 1 hour. 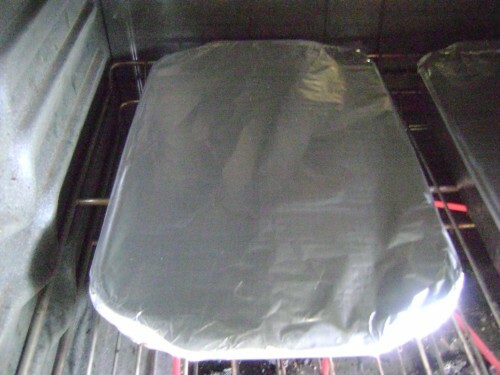 Take the foil off and cook 10 more minutes. Let this beautiful thing rest for about 10 minutes. Yeah–sadly, I didn’t have one bite of this batch. Oh, what bravery THAT took. 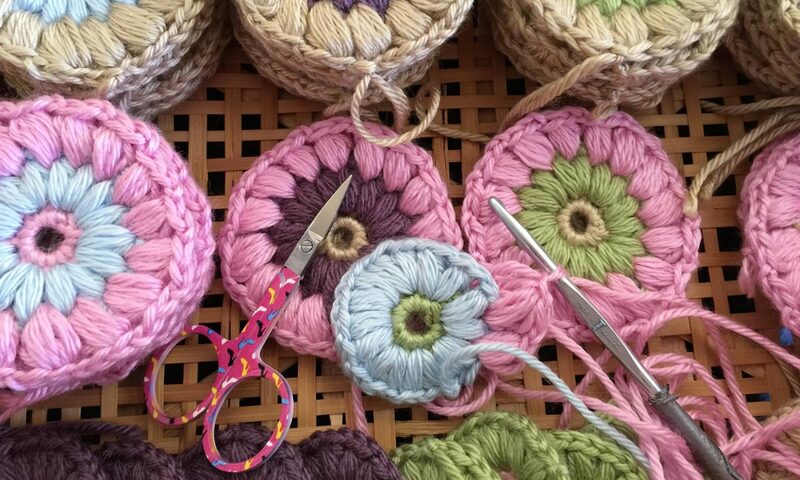 Layering is sooo much easier. Seriously, once the cheese is grated–this dish just flies together. And it’s just as easy to make two at a time and freeze one for later. So good. the cheese is always the best part. Mmmmm. That would be good for lunch, but I’ll have to be content with what I have here. I cheat and get pre-shredded mozzarella and then it REALLY goes together quickly! 😉 And for some reason I thought there was more than one layer of cottage cheese. Oh well… I don’t care how much is technically in it… it’s SOOO freaking good! What? I don’t have to cook the noodles first? Geez, I’ve been doing it the hard way all these years. And I’m like LyndiLou, I do buy the pre shredded mozzarella as well. 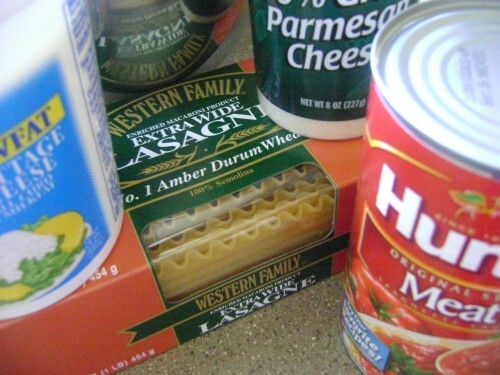 But now that I know I don’t have to pre cook the noodles, I may make lasagna more often. If cheese weren’t so dang expensive. And I have to put sausage in mine (I have men who crave meat in my family). At least next time it will be easier. Thanks for the tip. I couldn’t be that brave!! I give you props girl!